Pamper your skin with the comforting touch of the Nuxe Huile Prodigieuse Riche Multi-Purpose Nourishing Oil Spray - Face, Body and Hair. A richer version of the iconic Huile Prodigieuse dry oil that’s perfect for very dry skin, this repairing formula will provide intense nutrition whilst leaving a supple, satin finish. The versatile blend is perfect for use all over the body, face and hair, while its addictive orange blossom, magnolia and vanilla fragrance creates a moment of complete well-being. At the heart of the formula are 7 precious botanical oils, including tsubaki oil, almond oil, camellia oil, borage oil, hazelnut oil, macadamia oil and argan oil, each selected for their superior moisturising, anti-ageing and repairing properties. 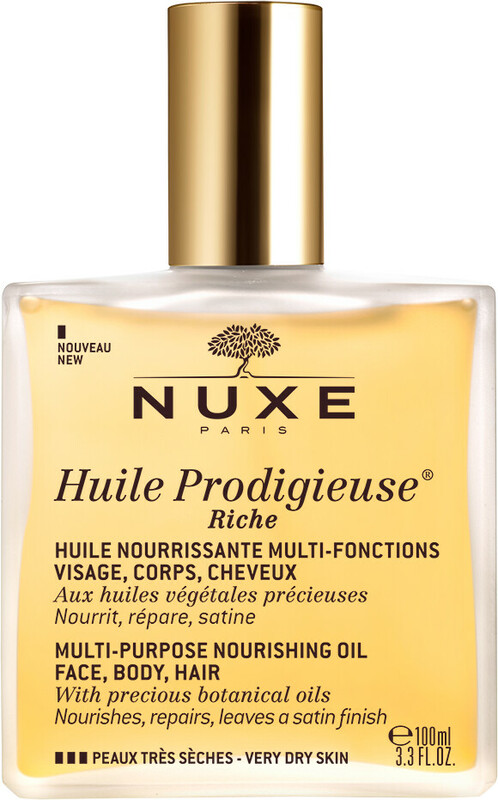 Free from silicones, Nuxe Huile Prodigieuse Riche instantly leaves skin feeling comforted. Apply once a day to the face either alone or mixed into your regular moisturiser. On the body, massage onto skin using circular motions. In the hair, use on the lengths and ends, or apply all over and leave on for 10 minutes once a week as a treatment. Free from parabens, preservatives, silicone and mineral oils. Non-comedogenic. 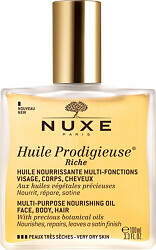 Nuxe Huile Prodigieuse Riche Multi-Purpose Nourishing Oil Spray - Face, Body and Hair 100ml is rated 5.0 out of 5 by 2.